Brought up in a working-class family in downtown Helsinki, Tarja Halonen has created a highly successful political career by building ties with trade unions and nongovernmental organizations. Serving as President since 2000, she has vehemently defended the President's role as commander in chief of the military and campaigned against Finnish membership in NATO. Her hobbies belie her powerful position: she is said to enjoy swimming and taking care of her two cats. 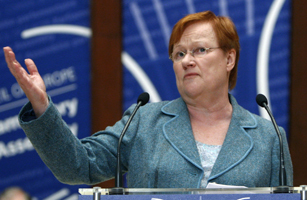 In 2006, TV host and comedian Conan O'Brien endorsed Halonen's re-election because of her strong resemblance to him. See a TIME video of the Air Guitar World Championships, held in Finland.